In continuation of his commitment to quality education and all embracing development, the lawmaker representing Egbeda/Onaara federal constituency Hon. 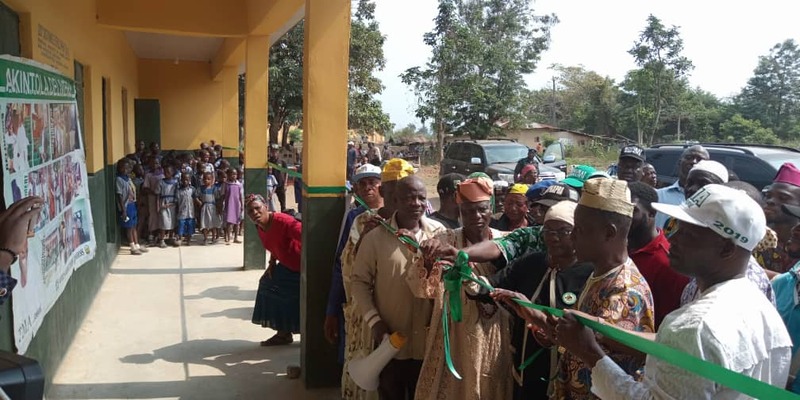 Taiwo Micheal Akintola on Thursday commissioned six classroom block in the constituency. Commissioning the project, Hon. Taiwo who is seeking reelection under the banner of the African Democratic Party, ADC noted, "education has taken a centre stage in global development. Already, it is a necessity and investment which every serious government must embrace with the seriousness that it deserves, because the current global world is driven by knowledge." "In the world over, the era when education was acquired in crowded and choked environment is becoming a thing of the past. Nations are striving daily to boost their knowledge base, support learning and capacity building where teachers and students will be happy to work and learn." "Therefore, in building these six classroom block for the primary schools, we have not only uplifted Ojuku and Badeku communities but have, again, lived up to our social responsibility and legislative philosophy to build a great society, the pride of generation to come." "To the glory of God, I am delighted to commission the six classroom block, today. I am also convinced that the children, parents and school authorities who are the ultimate beneficiaries of the projects will feel inspired to excel in their duties and studies." "This communal responsibility is to forge a sense of common purpose and shared objectives. I thank the residents and leaders of these communities as well as the management of the schools for being part of this epoch event, " Hon Taiwo stated. The commissioning was conducted by the senator representing Oyo central district and senatorial candidate of the party, Alhaja Monsurat Summonu, ably supported by traditional rulers and party leaders. Three classroom block were separately commissioned and handed over to the schools. The ventilated classrooms are furnished and equipped with chairs, desks and boards.